"Make this one-dish Italian-style skillet dinner--ready in 20 minutes--using Progresso™ Recipe Starters™ creamy Parmesan basil cooking sauce." Cook and drain ravioli as directed on package. In 10-inch skillet, heat 1 tablespoon vegetable oil over medium-high heat. Add chicken; cook 2 to 4 minutes, turning occasionally, until brown. Stir in cooking sauce, cooked ravioli and half-and-half; reduce heat. Simmer uncovered 3 to 5 minutes or until sauce is hot. Sprinkle with bacon, cheese and basil. See time-saving tricks for quick-and-easy pulled chicken sandwiches. Make a salad to go with this pasta dinner, and sprinkle it with leftover bacon bits. For an extra-easy addition, serve this hearty dish with oven-toasted garlic bread. Very good and very easy! 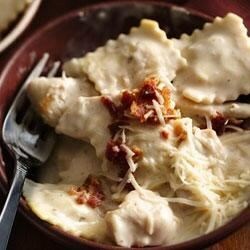 I suggest melting some shredded parmesan directly into the sauce, as well as bacon pieces.